<br/>The rest of the class starts furiously scribbling at their desks, hoping to be the first to solve the puzzle. 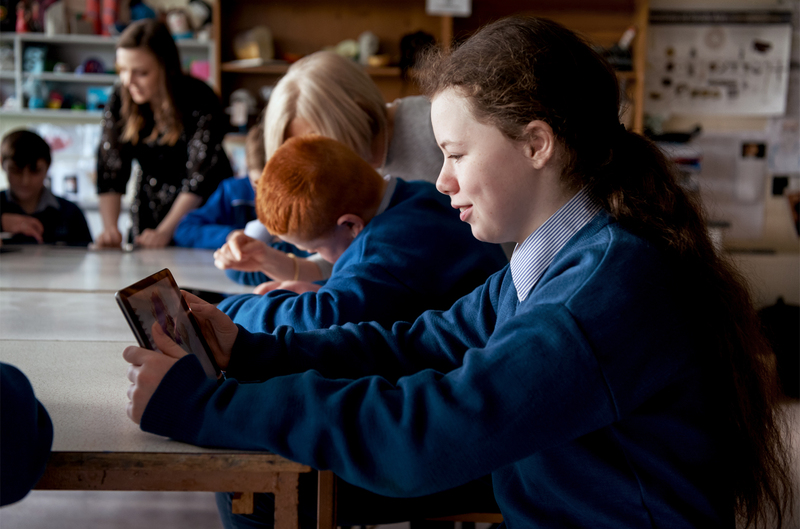 <br/>In coding class at Terence MacSwiney School in Cork, Ireland, things tend to get very competitive among this group of fourteen and fifteen year olds. That’s especially true for Normoyle and classmates Seán Harris and Michael McGlue — all three are vying to be named the year’s standout coding student. <br/>The program is part of a special initiative made possible by Apple volunteers from the company’s nearby Cork campus. Once a week, more than a dozen volunteers visit the school to help teach coding, drawing, photography, music and video. Since the program began three years ago, the school — one of the most economically disadvantaged in Ireland — and its students have been transformed. <br/>It’s one of thousands of organizations where Apple employees volunteer their time. And for every hour an employee gives, or dollar they donate, Apple provides matching funds for both. In 2018, that added up to more than a quarter of a million hours volunteered and more than $125 million donated to organizations around the world. <br/>That includes China, where Apple is one of the only global companies matching employee donations. Thirty-two Chinese charitable organizations are now eligible to receive funds, including the China Foundation for Poverty Alleviation, which aided more than 175,000 people across 24 provinces with disaster relief and preparedness in 2018 alone. <br/>All told, since its inception eight years ago, Apple’s Giving program has become a powerful force for global good, raising more than $365 million for nonprofits around the world. Though if you ask the people whose lives have been changed by these efforts, they’ll tell you that the benefit can be measured in so much more than dollars and cents. <br/>Before they started the program, Normoyle, Harris and McGlue never expected their future careers to involve coding. All three would be the first in their families to complete a post-secondary degree, something their teacher Linda Cagney and Principal O’Flynn say is now well within their reach. <br/>He smiles, and confirms that’s exactly right. <br/>Lauren Cook, 24, was a senior at San Jose State University in 2017, working four jobs to make ends meet when she saw a flyer advertising a Second Harvest food pantry at the school. She left with more than bags full of fresh produce. <br/>Since the Great Recession in 2008, the number of people served each month by Second Harvest Food Bank in Santa Clara and San Mateo Counties, which include most of Silicon Valley, has seen a 47 percent jump — from an average of 175,000 to 260,000. In 2018 alone that translated to almost 55 million meals. <br/>When Samuel Snowe, 29, opened the package containing his chest binder, he was surprised to find something else. <br/>That includes the organization’s apparel program, which has sent out more than 3500 free chest binders to people around the world including Snowe, along with a personal note of encouragement. <br/>For Snowe, receiving the free binder was essential, but he credits the note with even more.